Human placental lactogen is a placental hormone which is polypeptide in nature. 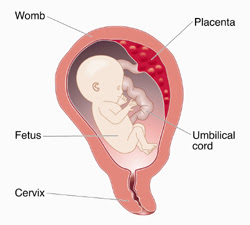 Human placental lactogen is abbreviated as hPL and is also known as human chorionic somatomammotropin abbreviated as HCS. It is produced by placenta (an endocrine gland which is developed during pregnancy and produces other hormones as well named progesterone. Estrogen and human chorionic gonadotropin. Human placental lactogen hPL is produced to feed the fetus by cutting the fats from mother’s body. Its functions resembles to the other hormone named growth hormone. The human placental lactogen (hPL) can cause gestational diabetes in mother because this hormone induces insulin resistance, as insulin is produced by the pancreas up to the concentration demanded but do not work properly and as a result the sugar level increases causing gestational diabetes. The metabolic state of the mother’s body is changed by the human placental lactogen hPL and facilitate energy to the developing fetus. This human placental hormone hPL is secreted by the syncytiotrophoblast. This hormone like other hormone named human growth hormone is encoded by genes on the chromosomes transferred. The level of human placental hormone hPL increases with the increasing development of fetus. And the maximum level achieved is 5 to 7 mg/L. The main function of human placental hormone hPL is to cut down the fat from mother body and feed the fetus in the form of energy. Its function resembles to both prolactin and human growth hormone as it works as strong agonist of the receptor of prolactin and weak agonist of receptor of growth hormone. It causes insulin resistance in mother body and cause gestational diabetes. Also the glucose utilization is decreased which shows the proper nutrition of fetus and according to this, whenever there is a hypoglycemic condition it will lead to increased production of human placental hormone HPL. As human placental lactogen hPL mimics the function of prolactin. It is produced during labor pains allowing the cervix to dilate and it pairs with the function of oxytocin increasing its activity. The sudden decrease in the human placental lactogen hPL will cause preeclamptic fetal delivery. The human placental lactogen hPL level remains same throughout delivery i.e. from the rupturing of membranes to the delivery. The half-life of human placental lactogen varies with the condition right after delivery to some time passed. The decrease in human placental lactogen hPL level shows abnormality in pregnancy.